After trying to find out how to use my leftover almond pulp from making homemade almond milk, I started to experiment. Crackers, cookies, cakes and cupcakes. 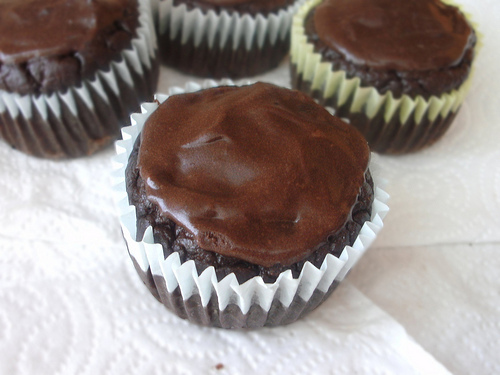 These healthy, sugar free chocolate cupcakes, made with stevia, are also high fiber and low in blood sugar spiking carbohydrates. Dried almond pulp acts almost like coconut flour, as coconut flour is the defatted coconut meat used to make coconut milk (see this recipe for cupcakes using coconut flour). Although there is more fiber and a different fatty acid profile, both almond milk and coconut flour can easily be swapped in any recipe called for either of them. Be sure to dry your almond pulp completely, as you will need to grind it into a fine powder before using. The tapioca starch listed in this recipe is rare for me, as I tend to stay away from all starches, including gluten-free starches, to avoid spiking my blood sugar and insulin levels. The amount of starch, however, is very low, contributing not even 1 gram of carbohydrate per cupcake. It is essential for the frosting to give it that “shine” that is very common in traditional powdered sugar frostings. Feel free to omit, if you like, or to substitute with your favorite gluten-free flour. Spread the almond pulp out on a sheet of parchment paper set on a cookie sheet. Dry in the oven at 275 F for at least an hour, or until crispy. In a dry blender or food processor, process the dried almond pulp into a meal. Place the (room temperature) eggs, almond milk and melted coconut oil into the blender. Give it a quick blend to emulsify the ingredients. Add the xylitol and blend a second time. Sift the dried almond pulp meal, cocoa flour, tapioca starch, salt and baking soda into the egg mixture in the blender. Blend until thoroughly mixed. Add stevia or other sweetener to taste. Pour batter 3/4 full into paper muffin cups. Bake cupcakes at 375 F for 25 minutes, or until light and springy to the touch. Let cool in pan for 30 minutes. Frost and serve. Melt 1 TBSP of butter in a small bowl with palm sugar or xylitol. Let the sugar melt completely. Take off heat and add 5 TBSP of softened butter, sifted cocoa powder and tapioca starch. Using a hand mixer, mix well until a creamy frosting forms. Add maple syrup, if using (maple syrup is lower on the glycemic index than honey). 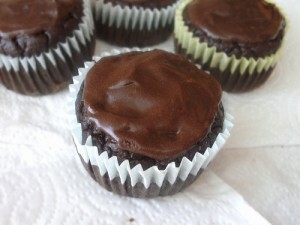 You are currently reading "Healthy (Gluten Free) Chocolate Cupcakes with Sugar Free Chocolate Frosting"